Another month, another inspiration board! October has already been off to an action packed beginning. Last week, all of our hard work planning & DIY-ing for Kyle's brother's wedding came to fruition. Such a wonderful weekend of celebrations, perfect fall weather and their family barn looked beautiful. Today, I had the privilege of speaking at Madison's Dream Bank about Pinterest. It was so awesome to have so many friends & peers show up for support! The October fun is just beginning. Kyle & I are jetsetting to Hawaii this weekend with my family and we couldn't be more excited. I'm so in need of some rest & relaxation mixed with a little bit of sun, sand & scenery. 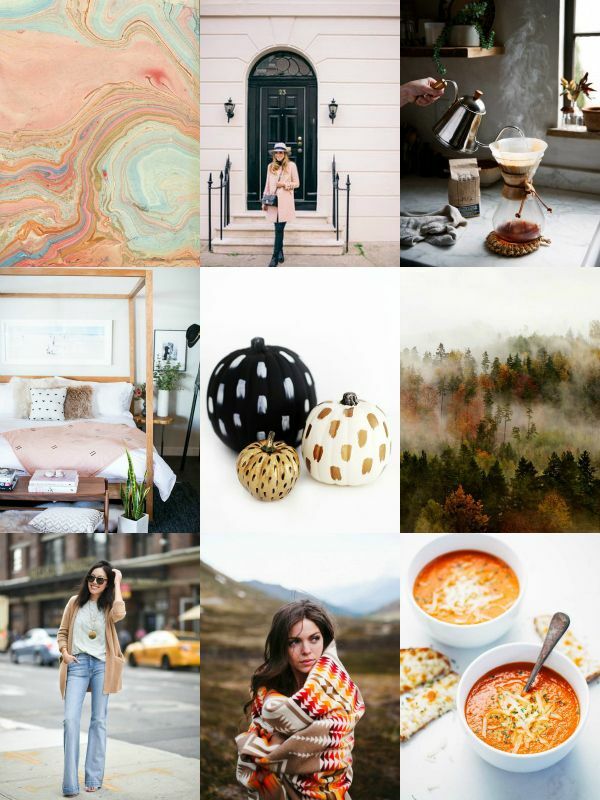 Other than the intense tropical vibes I'm feeling right now, these images depict exactly what's inspiring me in October. Pale pink, marbled patterns, taking the extra time for pour over coffee, painted pumpkins, misty autumn mornings and more. This month makes me want to cozy up in blankets, make some comfort food and go on some afternoon fall drives. To see even more of what's inspiring me- come see what I'm pinning! Over the next few weeks I'll be getting into the swing of Halloween- complete with my favorite, DIY costume ideas! I love all the autumn colours and knitted accessories around October.